Fish-Camp is my time with friends and guest. Where lessons are learned, laughter a must. Tears of pain when the big one comes off. And the tales get bigger each year! 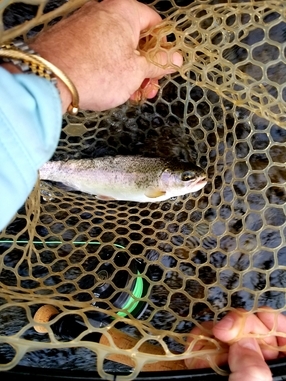 Photo right: Nothing is greater than a client landing a quality trout in my net! Updated Links page, now you can find daily weather reports for the destination you choose for fishing! "Flow's subject to change based on Mother nature"
Weather: For Weather check my links page for up to date reports. Best Bet: if one needed to fish Wappingers or EB of croton. 4/20/19: Most rivers and streams are rising slowly, this storm was not as bad as the last one, couple of days and the rivers will be fishable. 4/19/19: Here we go again, heavy rains predicted for tonight and Saturday morning. Looks like a wash. On the Bright side, Hendricksons in Hudson Valley and the lower Neversink area, I don't think the Catskills will see them for another week to 10 days. Does this remind you of last year, high water, didn't see to many Hendricksons, hopefully this is the last big storm for a long time. 4/17/19: Rivers are slowly receding and clearing. Still to high to wade fish. I'm a little worried about the weekend fishing as we are expected to get another round of rain Friday night. 4/16/19: Wow, did the Catskills received some rain Sunday night, Read a report that Phoenica area received about 7 inches of liquid, while Sullivan county Clarryville area received about 5 inches, It will take sometime for the rivers to get normal. The good news is my trailer didn't float down river! 4/12/19: Cool day yesterday, left the shop at 2 pm to scout. Went to the EB of the Delaware, water temp was 42 degrees, had Olives #18's on the water 7 or 8 fish rising to them, sorry to say no hook-ups. 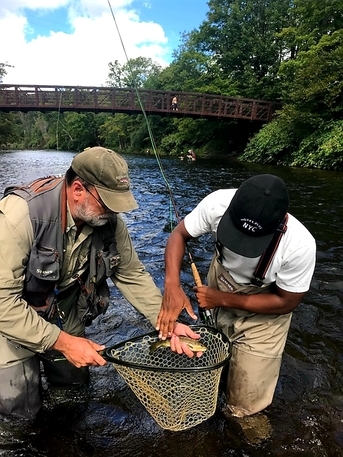 Beaverkill and Willowemoc remain high, Streamers and nymphs are the ticket, West branch of the Delaware have had rising fish in the afternoon. Neversink remains high, lower end is your best bet though. Bugs here in the Catskills, Olives mix, Blue quills. Dress properly the tailwaters are cold on the legs this time of the year! 4/9/19: Yesterday again scouted some water, Best placed to fish was the East branch of the Del. I fished from 1PM to 3:30 PM, Olives were in the air along with black stones, did see a Gordon but it's still early for them. 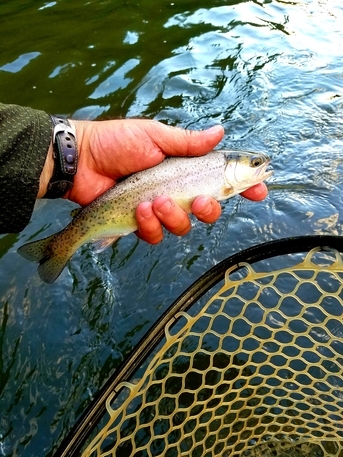 I took my first brown on a Olive emerger #18, broke the ice so to speak with a dry fly. The Brown was roughly 15/16 inches. 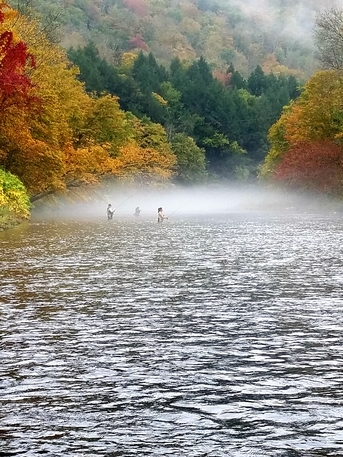 Water temp at time of hooking fish was 46 degrees, flow was 714 cfs. 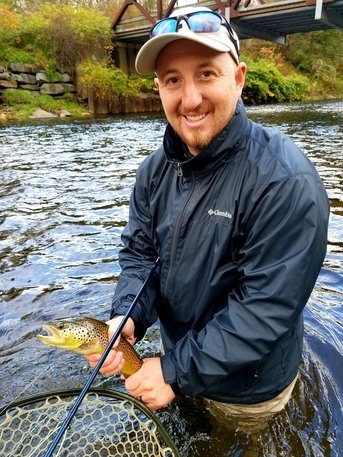 10/13/18: Max from N.J. with his first ever Brown on a fly-rod, the Brown took a black muddler on his first or second cast. 10/7/18: Fall in the Catskills, photo taken yesterday morning at Hazel Bridge on the Willowemoc. Absolutely Beautiful! 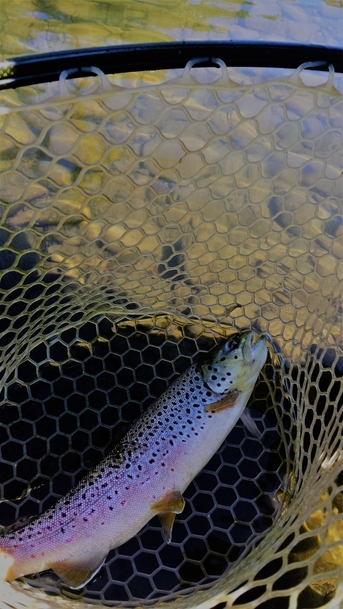 10/7/18: Bill from Toronto Canada looking down at a Wild Rainbow caught in the Beaverkill, the Rainbow sipped my Brown floating nymph! 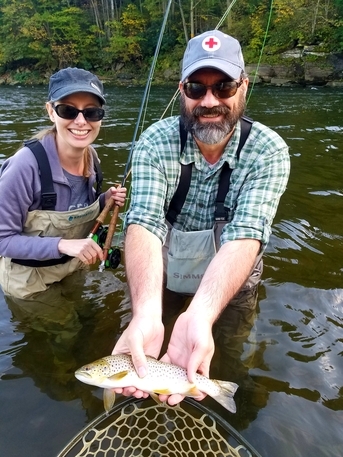 10/5/18: Photo below, Brady and Stephanie from Washington D.C. with Brady's first ever Beaverkill Trout on a Fly-rod! The Brown took a size #18 BWO. 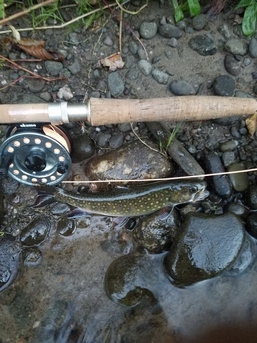 9/17/18: Photo's above and Below, My time fishing, two pretty fish caught up in the Upper Willowemoc, the Browns all took a orange stimulator, the Brookies loved the Royal Coachmen #16. Sunset was awesome with purples and reds! 9/15/18: Nostalgic afternoon for me using my Bamboo rod! 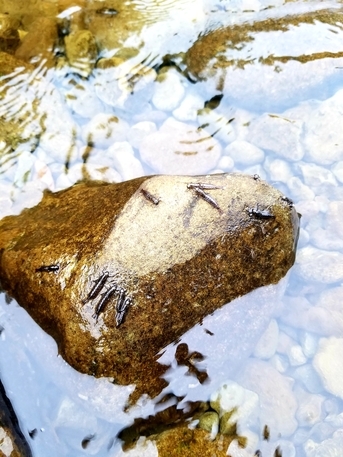 Took a few Browns on the Willowemoc in the afternoon, they took a CDC Tan caddis emerger #14. I love fishing soft rods, weather it's Bamboo or Fiberglass! 9/15/18: Kendall from NYC with his first ever Brown trout caught on a fly-rod! The Brown took a Royal coachman. 9/4/18: Amanda from NYC, with her first Beaverkill Brown caught on a fly-rod. The Brown took a BWO parachute #20. 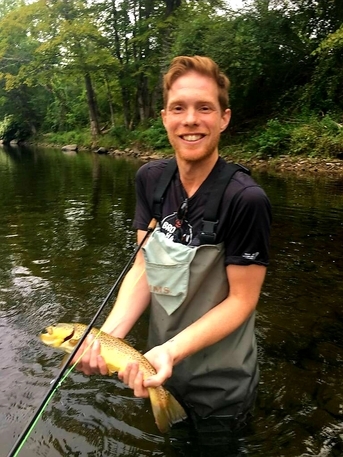 9/3/18: Kyle from NYC with his first ever Brown caught on a Fly-rod. The Brown took a foam beetle size #14. 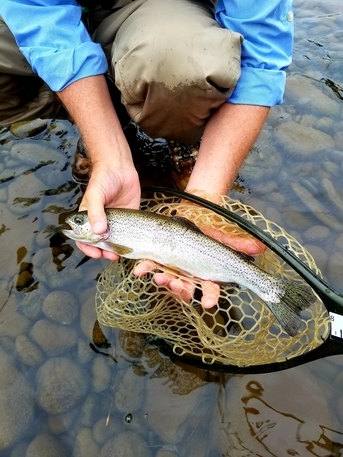 9/1/18: Top photo, Fred from Kentucky, his first ever Beaverkill Rainbow! The Rainbow took a Iso compara dun. Bottom photo: The Iso's migrating to the rocks and Hatching, Water and air temps cooled down enough overnight. 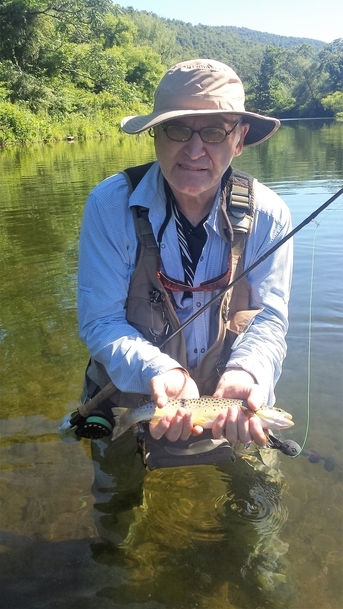 8/30/18: John from NYC with his first ever Brown trout caught on a fly-rod! The brown took a size #14 bettle. 8/29/18: Father and Son, Tim and Paul on a full day guide trip, Tim with the Best fish of the day, the Brown took a #14 Beetle. 8/27/18: Everybody appreciates photo's of big fish, But as a Guide it's the first one ever caught on a Fly-rod! This is Aaron from Brooklyn and his Brown ate a Tan caddis #16! His first ever! 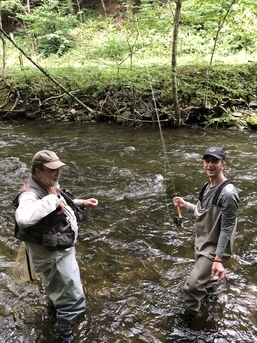 8/19/18: Top and Bottom Photo's: Fun day with Brookies with Jeff and Gabe Father and son in the Catskills for lessons. While everyone is waiting for the lower rivers to clear, I have found fish for my clients! 8/1/18: Chris from L.I. with his best fish of the morning! The Brown took a size #14 beetle. 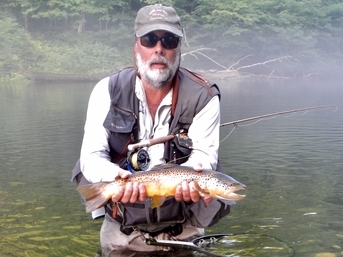 7/15/18: Upper photo Jim from Maryland, with a nice West branch Brown, The Brown took a size #12 Cahill. 7/15/18: Bottom photo, Jim's son Colby with his first West Branch Brown, again the Brown took a Cahill, size #12. 7/14/18: Mike from NYC, with his first ever West branch of the Delaware Brown. The Brown took a Cahill parachute. 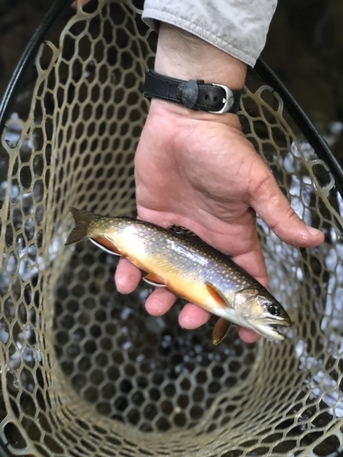 7/13/18: Second Brookie of the year taken in the East branch of the Delaware, the Brookie took a size #22 brown floating nymph. 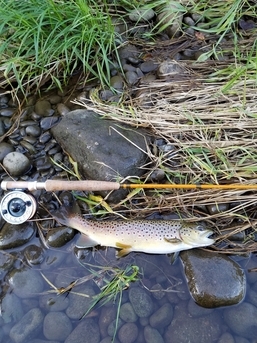 Bottom photo, fishing frog water, this nice Brown took the size #22 brown floating nymph on 7X tippet, it is the reason I love my 4 wt. fiberglass rod, it has such good forgiveness on fine tippet! 7/8/18: Jeff from Westchester, best Brown of four, the Browns took a size #14 beetle. 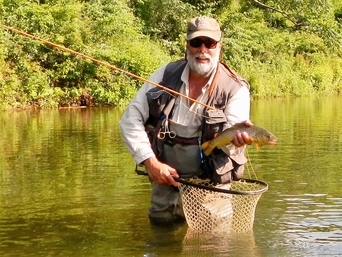 7/8/18: Top photo, Jeff from Westchester with his best fish of the day, the Brown was very aerobatic and gave us joy as he jumped, East branch of the Delaware, took a size #20 sulpher. Bottom photo, Blake at the Beaverkill Valley Inn, with his best Brown, the Brown took a size #14 beetle. 7/7/18: The new rule fish, the only fish I landed over 12 inches, this brown a stocked fish on the East was 15 inches! The Brown took a sulpher cripple. 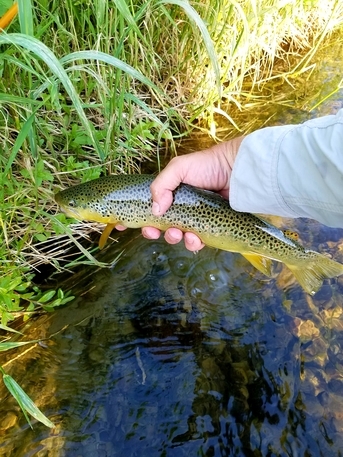 7/3/18: Best Brown on my 4 wt, fiberglass rod, 20 inches, the Brown took a Sulpher cripple in very slow water. I took 2 other fish also. Great night on the EB. 7/3/18: Is this the Ghost of Theodore Gordon? No just Andre in the Fog! Fishing the East branch! 7/1/18: Unusual catch on the East branch of the Delaware, a Brookie that took a CDC Sulpher emerger #16. 6/29/18: A very Pretty East branch of the Delaware Brown, used my 4 wt, fiberglass, took a size #14 sulpher! 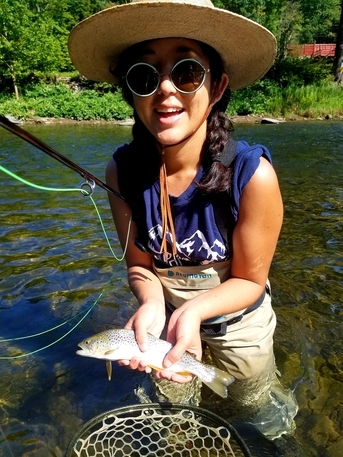 6/29/18: Sonia from NYC, with her first and best fish of the day, a Beaverkill brown that took a Yellow stimulator. 6/28/18: Unusual night on the East branch of the Delaware, where I caught more Rainbows than Browns. 4 to 2, All fish took my Brown floating nymph size #18. Love my 4 wt Glass rod! 6/23/18: Steve Greer from California with his best fish of the morning, the Brown took a #20 Olive Parachute. 6/10/18: Best fish of the Day on the Beaverkill goes to David Pring, the Brown took a size #14 Olive.